2017-05-08 First worldwide family litigation filed litigation Critical https://patents.darts-ip.com/?family=34746010&utm_source=google_patent&utm_medium=platform_link&utm_campaign=public_patent_search&patent=EP1570833(A1) "Global patent litigation dataset” by Darts-ip is licensed under a Creative Commons Attribution 4.0 International License. d- at least one polyethyleneglycol with a molecular weight of more than 10,000. Compositions for the treatment of human hair have been known for some time, they generally comprise various conditioning substances. Such compositions are customarily used as aqueous dispersions or emulsions, micro-emulsions or gels. An overview of the known hair treatment preparations and the composition thereof can be found, e.g., in the monography of K. Schrader, "Grundlagen und Rezepturen der Kosmetika", 2nd Ed. (1989), pages 722 to 736, 754 to 760. Post-treatment compositions, also including styling preparations, are customarily applied subsequently to a hair treatment, in particular after washing with a shampoo composition or eventually after conditioning hair either with a rinse off hair conditioner also know as treatment or rinse preparations or after a leave in as well conditioner composition or also a coloration or permanent waving treatment terminating with a final shampoo or rinse treatment. So-called hair waxes have also become known, which, as the name implies, consist of natural or synthetic products, In spite of their initial superficial conditioning performance, those products have been proven to weigh down hair and result in after a short period of time loss of volume. Furthermore, hair feel is judged to be, by hair specialists as well by group of consumer often using the product, is very artificial and not cosmetic at all in terms of hair softness, finger through and/or flexibility. The user of the product group especially complains on oily and/or artificially covered feeling of hair after application of the products. Additionally, the wax type of preparations has one important practical usage problem, which is removability from product packaging as they are usually packed into a jar type of containers. A solution to such kind of problem has been suggested in a German Patent Application from the same applicant, which is published under number DE 102 00 341 A1, as lowering melting point of the formulation, so that it melts quickly when touching the product with fingers. This may overcome the practical problem of removability, but will not help at all in solving aforementioned cosmetic problems. The objective of the present invention is therefore, making a composition available, which does not show above mentioned cosmetic problems. d- at least one polyethylene glycol with a molecular weight of more than 10,000. The emulsion composition according to the invention is preferably a micro emulsion, which is either non-transparent or semi-transparent and can as well transparent appearance. Compositions according to the invention improve hair properties in terms of especially soft texture, gloss, elasticity, flexibility, bounce and in particular improved formability and thereby better compliance. Gloss, softness and natural feeling when touching hair are found to be particularly important properties of the hair treatment compositions of the present invention. R1 and n are same as above. Examples to those types of nonionic surfactants are PEG-7-glyceryl cocoate known with the trade name Cetiol HE from Cognis, PEG-8-glyceryl laurate know with the trade name Glycerox L8 from Croda Chemicals, PEG-10 glyceryl oleate, PEG-15 glycerryl isostearate, PEG-5 glycerryl stearate, PEG-15 gylceryl ricinoleate, etc..
Further nonionic surfactants suitable for treatment compositions according to the invention are alkyl polyglucosides of the general formula R2-O-(R3O)n-Zx. wherein R2 is an alkyl group with 8 to 18 carbon atoms, R3 is an ethylene or propylene group, Z is a saccharide group with 5 to 6 carbon atoms, n is a number from 0 to 10 and x is a number between 1 and 5. Nonionic surfactant components are, for example, long-chain fatty acid mono- and dialkanolamides, such as coco fatty acid monoethanolamide and myristic fatty acid monoethanolamide, which can also be used as emulsifiers according to the invention. Additionally useful nonionic surfactants are the various sorbitan esters, such as polyethylene glycol sorbitan stearic acid ester, fatty acid polyglycol esters or polycondensates of ethyleneoxide and propyleneoxide, as they are on the market, for example, under the trade name "PluronicsR", as well as fatty alcohol ethoxylates. Still further suitable nonionic surfactants as emulsifiers are amineoxides. 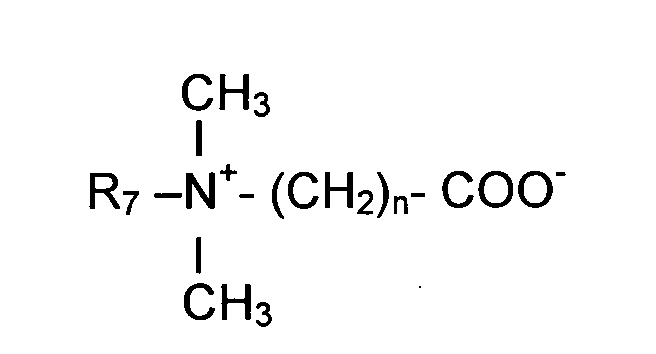 Such amineoxides are known especially because of their use in cleansing compositions, for example C12-C18- alkyl dimethyl amineoxides such as lauryl dimethyl amineoxide, C12-C18- alkyl amidopropyl or -ethyl amineoxides, C12-C18 -alkyl di(hydroxyethyl) or (hydroxypropyl) amineoxides, or also amineoxides with ethyleneoxide and/or propyleneoxide groups in the alkyl chain, Those are on the market, for example, under the trade names "Ammonyx®", "Aromox®" or "Genaminox®". Concentration of nonionic surfactants in total independent from presence of number of surfactants as emulsifiers is between 0.5% and 35%, preferably 1% and 30% and most preferably 5 and 25% by weight calculated to the total composition. Hair treatment composition of the present invention can comprise further anionic surfactants as emulsifiers, preferred in a mixture with one or more nonionic surfactants. The mixing ratio of nonionic and anionic surfactants is in the range of 10:1 to 1:3. preferably 5:1 to 1:2. most preferably 2:1 to 1:1. Concentration of anionic surfactants in the hair treatment compositions of the present invention can vary between 0.5% and 35%, preferably 1% and 30% and most preferably 1% and 25% by weight calculated to the total composition. where R3, R4 and R5 are same or different, saturated or unsaturated, linear or branched alkyl chain with 10 to 22 C atoms or R3 (CH2CH2O)n, R4 (CH2CH2O)n or R5 (CH2CH2O)n where R3, R4 and R5 are same as above and n is 1 to 10. 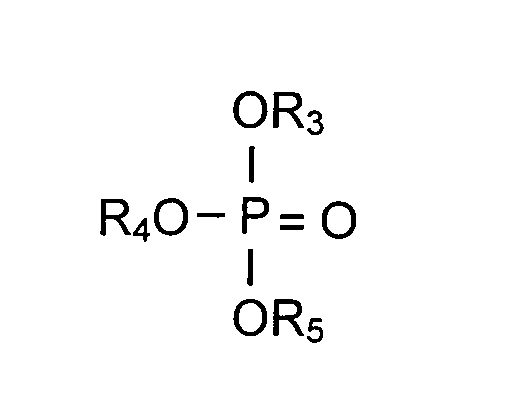 Non-limiting examples to such surfractants are trilaureth-4-phosphate known with the trade name Hostaphat from Clariant, trideceth-6-phosphate, trideceth-10-phosphate and tristeareth-4-phosphate. Trilaureth-4-phosphate is the most preferred one among them. Further anionic surfractants of the sulfate, sulfonate, carboxylate types are as well suitable as emulsifiers in the hair treatement composition of the present invention. Those are the ones very commonly used in cosmetic cleansing preparations, for example, the known C10-C18-alkyl sulfates, and in particular the respective ether sulfates, for example, C12-C14-alkyl ether sulfate, lauryl ether sulfate, especially with 1 to 4 ethylene oxide groups in the molecule, monoglyceride (ether) sulfates, fatty acid amide sulfates obtained by ethoxylation and subsequent sulfatation of fatty acid alkanolamides, and the alkali salts thereof. Additional aniotic surfactants useful within the scope of the invention are α-olefin sulfonates or the salts thereof, and in particular alkali salts of sulfosuccinic acid semiesters, for example, the disodium salt of monooctyl sulfosuccinate and alkali salts of long-chain monoalkyl ethoxysulfoccinates. wherein R6 and X have the above meanings, and n is in particular a number from 1 to 10, preferably 2.5 to 5. Such products have been known for some time and are on the market, for example, under the trade name "AKYPO®" and "AKYPO-SOFT®". Also useful are C8-C20-acyl isethionates, alone or in mixture with other anionic surfactants, as well as sulfofatty acids and the esters thereof. It is also possible to use mixtures of several anionic surfactants in mixture within the scope of the invention. Further suitable anionic surfactants are also C8-C22-acyl aminocarboxylic acids or the water-soluble salts thereof. Especially preferred is N-lauroyl glutamate, in particular as sodium salt, as well as, for example, N-lauroyl sarcosinate, N-C12-C18-acyl asparaginic acid, N-myristoyl sarcosinate, N-oleoyl sarcosinate, N-lauroyl methylalanine, N-lauroyl lysine and N-lauroyl aminopropyl glycine, preferably in form of the water-soluble alkali or ammonium, in particular the sodium salts thereof, preferably in admixture with the above-named anionic surfactants. As further surfactant component, the compositions according to the invention can also contain amphoteric or zwitterionic surfactants as emulsifiers. Useful as such are in particular the various known betaines such as alkyl betaines, fatty acid amidoalkyl betaines and sulfobetaines, for example, lauryl hydroxysulfobetaine; long-chain alkyl amino acids, such as cocoaminoacetate, cocoaminopropionate and sodium cocoamphopropionate and -acetate have also proven suitable. wherein R7 and n are same as above. Hair treatment composition of the present invention comprises one or more oil and/or mineral oil at a concentration of 1% to 35%, preferably 1 to 30% and most preferably 5 to 25% by weight calculated to total composition, Suitable natural oils are such as avocado oil, coconut oil, palm oil, sesame oil, peanut oil, whale oil, sunflower oil, almond oil, peach kernel oil, wheat germ oil, macadamia nut oil, night primrose oil, jojoba oil, castor oil, or also olive oil, soya oil, and the derivatives thereof. Mineral oils such as paraffin oil and petrolatum are suitably contained within the scope of the present invention, It should as well be noted that hair treatment compositions can contain mixture of one or more natural oils and mineral oil. Further suitable hydrophobic oil components are in particular fatty alcohol fatty acid esters such as isopropyl myristate, palmitate, stearate and isostearate, oleyl oleate, isocetyl stearate, hexyl laurate, dibutyl adipate, dioctyl adipate, myristyl myristate, oleyl erucate, polyethylene glycol and polyglyceryl fatty acid esters, cetyl palmitate, etc..
At least one silicone oil is the fourth essential part of the hair treatment compositions within the scope of the present inventions. Those are contained in mixture with natural and/or mineral oils in a weight ratio 20:1 to 1:1, preferably 15:1 to 1:1 and more preferably 10:1 to 1:1 (ratio of sum of natural and/or mineral oils to silicone oil). Preferred are the non-volatile silicone oils. Preferred ones are known with their INCI name as dimethicone, dimethiconol and cyclomethicone, Commercially, they are available from various companies for example Dow Corning with the known DC series, Wacker Chemie and Toray silicones. All commercially available non volatile silicones are suitable in the compositions of the present invention. Examples to those are DC 200 series, DC1401, DC 1403, DC 1501 and DC 1503. Volatile silicone oils can as well be contained in the hair treatment compositions in mixture with nonvolatile silicone oils within the scope of the present invcention with the consition that their content should not exceed ¼, preferably 1/10 of the nonvolatile silicone oil content of the composition. Cationic silicones know with INCI name as amodimethicone can as well be contained in the compositions of the present invention. Commercially it is available under the trade name DC 929 in emulsified form in mixture with a nonionic surfactant and a cationic surfactant. Concentration of silicone oils in hair treatment compositions of the present invention is in the range between 0.1 % and 10%, preferably 0.1 % and 7.5% and most preferably 0.1 and 5% by weight calculated to total composition. Hair treatment compositions of the present invention can be in the form of either leave in or rinse off emulsions, especially micro emulsions, used on hair, preferably after shampooing. Leave- in application of the compositions of the present invention is preferred. In the case of a leave in application, the treatment composition of the present invention can as well be used on dry hair without washing and/or shampooing hair for refreshing the hair properties, especially softness and shine. Hair treatment compositions according to the present invention do not contain any fatty and wax components. In the especially preferred embodiment the compositions of the present invention are free of any fatty alcohol. The fourth essential component in the treatment compositions of the present invention is those high molecular weight polyethyleneglycols with a molecular weight of above 10.000. Those are known with their CTFA name for example PEG-30M. which has a molecular weight of 30.000 and commercially available from the company Amerchol under the trade name Polyox WSR. for example Polyox WSR N60-K. which has a CTFA adopted name PEG-45M. polyethyleneglycol with 45.000 molecular weight. Further examples are such as PEG-14M, PEG-20M, PEG-23M, PEG-25M, PEG-90M, PEG-115M, PEG-160M, etc.. Concentration of the high molecular weight polyethyleneglycols is in the range of 0.05% to 2.5%, preferably 0.1 % to 1.5% and most preferably between 0.1 to 1.0% by weight calculated to total composition. R10 and R11 are independent from each other H or lower alkyl chain with 1 to 4 carbon atoms, and X is chloride, bromide or methosulfate. It should be noted that quaternary ammonium compounds with single alkyl chain are as well emulsifiers. This should certainly not mean that, they are excluded to be used as conditioning ingredients. With the above it is especially stated that the single alkyl chain cationic surfactants have emulsifying ability as well. The others, such as di alkyl dimonium chloride, is more preferred as conditioner as will be explained below. Suitable cationic surfactants and or conditioning agents are, for example, long-chain quaternary ammonium compounds which can be used alone or in admixture with one another, such as cetyl trimethyl ammonium chloride, myristoyl trimethyl ammonium chloride, trimethyl cetyl ammonium bromide, stearyl trimethyl ammonium chloride, dimethyl stearyl ammonium chloride, dimethyl dihydrogenated tallow ammonium chloride, stear trimonium chloride, dipalmitoyl dimonium chloride, distearyl dimethyl ammonium chloride, stearamidopropyl trimonuim chloride and dioleoylethyl dimethyl ammonium methosulfate, etc..
From the above quaternary ammonium compounds disclosed with the general formula, especially preferred as hair conditioning agents are those compounds known per se and are on the market, for example, under the trade names "Schercoquat®", "Dehyquart® F30" and "Tetranyl®". Use of these compounds, the so-called "esterquats", in hair care compositions is described, for example, in WO-A 93/107 48, WO-A 92/068 99 and WO-A 94/166 77, wherein, however, there is no reference made to the combinations according to the present invention and the advantageous properties thereof. Again from the above quaternary ammonium compounds disclosed with the general formula, especially preferred as conditioning ingredient are these compounds are known per se and on the market, for example, under the trade name "INCROQUAT® HO" or "OCS". Those compounds are known with a general ingredient category under "amidoquat" in the cosmetic industry. A further preferred component used in the emulsions or micro emulsions according to the present invention are polyols such as propylene glycol, glycerol, sorbitol, propanediol and butanediol. preferably in an amount from 1 % to 50 %, preferably 1 % to 40% and more preferably 5% to 30% and most preferably 5% to 25% by weight. in particular about 10 % to about 25 % by weight, calculated to the total emulsion. Composition of the present invention may comprise cationic polymers as conditioning agents. 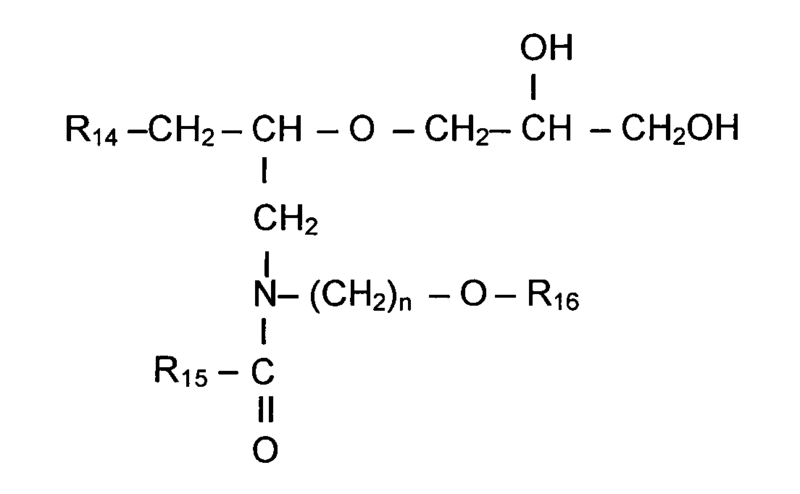 Those are cationic cellulose type polymers know as Polymer JR type from Amerchol such as Polyquaternium 10 or cationic guar gum known with trade name Jaguar from Rhône-Poulenc and chemically for example Guar hydroxypropyl trimonium chloride. Furthermore. chitosan and chitin can also be included in the compositions as cationic natural polymers. Furthermore, those cationic polymers known with their CTFA category name Polyquaternium may as well be added into the compositions of the present invention. Typical examples of those are Polyquaternium 6, Polyquaternium 7, Polyquaternium 10, Polyquaternium 11, Polyquaternium 16, Polyquaternium 22 and Polyquaternium 28, Polyquaternium 30, Polyquaternium 37, Polyquaternium 36, Polyquaternium 46. As well those polymers known with their CTFA category name Quaternium can as well be suitable. Those are for example Quaternium-8, Quaternium-14, Quaternium-15, Quaternium-18, Quaternium-22, Quaternium-24, Quaternium-26, Quaternium-27, Quaternium-30, Quaternium-33, Quaternium-53, Quaternium-60, Quaternium-61, Quaternium-72, Quaternium-78, Quaternium-80, Quaternium-81, Quaternium-81, Quaternium-82, Quaternium-83 and Quaternium-84. In this context, reference is also made to the cationic polymers disclosed in DE 25 21 960, 28 11 010, 30 44 738 and 32 17 059, as well as to the products described in EP-A 337 354 on pages 3 to 7, It is also possible to use mixtures of various cationic polymers. The cationic polymers also include the quaternized products of graft polymers from organopolysiloxanes and polyethyl oxazolines described in EP-A 524 612 and EP-A 640 643. The compositions according to the invention may also comprise further agents, such as protein hydrolyzates and polypeptides, e.g. keratin hydrolyzates, collagen hydrolyzates of the type "Nutrilan®" or elastin hydrolyzates, as well as, in particular vegetable, optionally cationized protein hydrolyzates, for example "Gluadin®". Additional natural plant extracts can as well form part of the compositions of the present invention. Those are incorporated usually in an amount of about 0.01 % to about 5 %, preferably 0.05 % to 3.5 %, in particular 0.1 % to 2 % by weight, calculated as dry residue thereof to the total composition. Suitable aqueous (e.g. steam-distilled) alcoholic or hydro-alcoholic plant extracts known per se are in particular extracts from leaves, fruits, blossoms, roots, rinds or stems of aloe, pineapple, artichoke, arnica, avocado, valerian, bamboo, henbane, birch, stinging nettle, echinacea, ivy, wild angelica, gentian, ferns, pine needles, silver weed, ginseng, broom, oat, rose hip, hamamelis, hay flowers, elderberry, hop, coltsfoot, currants, chamomile, carrots, chestnuts, clover, burr root, coconut, cornflower, lime blossom, lily of the valley, marine algae, balm, mistletoe, passion flower, ratanhia, marigold, rosemary, horse chestnut, pink hawthorn, sage, horsetail, yarrow, primrose, nettle, thyme, walnut, wine leaves, white hawthorn, etc. Suitable trade products are, for example, the various "Extrapon®" products, "HerbasolR ", "SedaplantR" and "HexaplantR". Extracts and the preparation thereof are also described in "Hagers Handbuch der pharmazeutischen Praxis". 4th Ed.. The hair treatment compositions compositions may contain one or more organic solvents within the scope of the invention, such as ethanol, propanol, isopropanol, benzyl alcohol, benzyloxyethanol, alkylene carbonates such as ethylene carbonate and propylene carbonate, phenoxyethanol, butanol, isobutanol, cyclohexane, cyclohexanol, hexyleneglycol, ethylenecarbonate, ethyleneglycol monoethylether, ethylene glycol monobutyl ether, ethylene glycol monophenyl ether, 1-phenylethylalcohol, 2-phenylethylalcohol, o-methoxyphenol. Concentration of organic solvents in the composition should not exceed 10%, preferably 7.5 and more preferably 5% by weight. Compositions of the present invention may contain UV filters either for stabilization of the product colour or for protection of hair from environmental influences such as loss of elasticity, loss of hair colour (bleaching effect of sun light). 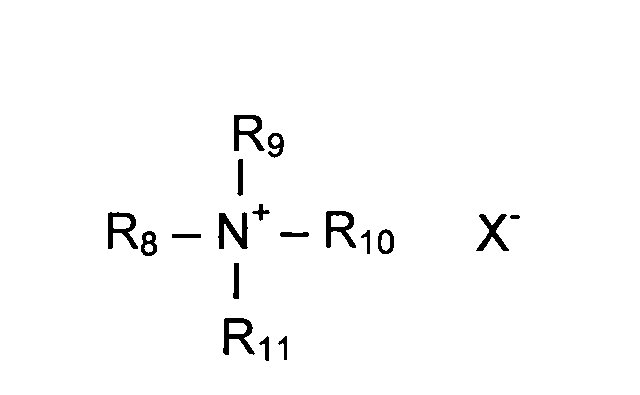 The UV-absorbing substance is preferably selected from the following compounds: 4-Aminobenzoic acid and the esters and salts thereof, 2-phenyl benzimidazole-5-sulfonic acid and the alkali and amine salts thereof, 4-dimethyl aminobenzoic acid and the esters and salts thereof, cinnamic acid and the esters and salts thereof, 4-methoxycinnamic acid and the esters and salts thereof, salicylic acid and the esters and salts thereof, 2,4-dihydroxybenzophenone, 2,2',4,4'-tetrahydroxybenzophenone, 2-hydroxy-4-methoxybenzophenone and its 5-sulfonic acid or the sodium salt thereof, 2,2'-dihydroxy-4,4'-dimethoxybenzophenone, 2-hydroxy-5-chlorobenzophenone, 2,2'-dihydroxy-4-methoxybenzophenone, 2,2'-dihydroxy-4,4'-dimethoxy-5,5'-disulfobenzo-phenone or the sodium salt thereof, 2-hydroxy-4-octyloxybenzophenone, 2-hydroxy-4-methoxy-4'-methylbenzophenone, 3-benzyl-idenecampher, 3-(4'-sulfo)-benzyl-idenebornane-2-one and the salts thereof and/or 3-(4'-methyl benzylidene)-DL-campher. The compositions of the present invention can comprise hair-restructuring agents. The hair restructuring agents preferred are especially the ones disclosed in the German patent DE 197 51 550 C2. 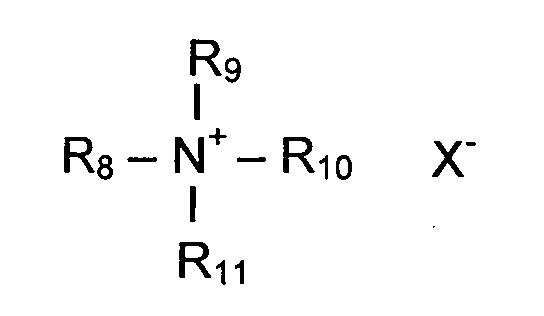 where R14 and R15 are independent from each other alkyl- or, alkenyl group mit 10 to 22 carbon atoms, R16 is methyl, ethyl, n-propyl or isopropyl group and n is a number between 1 to 6, preferably 2 or 3. Other preferred hair restructuring agents are fatty acids with 10 to 24 carbon atoms and especially with 16 to 24 carbon atoms. Sterols,especially the phytosterols, are as well preferred hair restructuring agents as disclosed in the above mentioned german patent. Especially preferred ones are of plant origin for example ergosterol, sitosterol, stigmasterol, fucosterol, brassicasterol, fungisterol, campesterol, zymosterol, ascosterol, cerevisterol, episterol, faecosterol, spinasterol. Among those phytosterols, the ones found in "Avocadin" which is the unsaponified fraction of the avocado oil is more preferred. The concentration of ceramide in the compositions of the present invention can be in the range of 0.01 % to 2% and especially 0.01 % to 1% by weight calculated to the total weight of the composition. The fatty acids may be contained at a level of 0.01 to 2.5% and epecially 0.01 to 1% by weight calculated to the total weight of the composition. Phytosterol concentration of the conditioners is less than 1% and preferably less than 0.5% by weight calculated to the total weight of the composition. It should be noted without limiting the use of those ingredients the effect of those hair restructuring ingredients is especially elevated when all three of above mentioned ingredients are used in combination with penetration enhancers. The hair treatment composition can contain complexing agents, solubilizers, preservatives, pH-regulants, the extent they are not already contained in the original surfactant mixtures, fragrances, thickening agents, and moisturizers. The pH of the compositions according to the invention is in the range of 5 to 8. For adjusting the pH of the said compositions, following ingredients can be used: Organic acids such as citric acid, tartaric acid, fumaric acid, levulinic acid, butyric acid and hydroxy butyric acids, valeric acid, oxalic acid, succinic acid, mandelic acid, glycolic acid, glucuronic acid, propionic acid, salicylic acid or acetic acid or inorganic acids such as hydrochloric acid, phosphoric acid, sulphuric acid, nitric acid. The viscosity of the compositions is above 100,000 mPa.s measured with a Brookfield viscosimeter at 20°C from a Helipath Spindle Set with a spindle F at 10 rpm. Viscosity values are preferably above 250,000 and more preferably above 400,000. The styling polymer or polymers is/are selected from the anionic, non-ionic, cationic and/or amphoteric or zwitterionic ones can as well be contained in the hair treatment compositions according to the present invention. Suitable non-ionic polymer is first of all vinylpyrrolidon polymers either homopolymers or copolymers with, especially, vinylacetate. Those are known with the trade name "Luviskol" as homopolymers Luviskol K 30, K 60 or K 90 as well copolymers Luviskol VA 55, VA 64 from BASF AG. Further non-ionic polymer suitable for compositions of the present invention is vinylpyrrolidone/vinylacetae/vinylpropionate copolymer known with the trade name Luviskol VAP 343 as well from BASF. Natural non-ionic polymers are as well suitable for the composition of the present invention. Those are such as cellulose, chitosan, guar gum, neutralised shellac and their derivatives. Amphoteric or zwitterionic polymers may be contained in composition of the present invention. Examples are copolimerisate of n-octylacrylamide, acrylic or metahcrylic acid and tert.-butylaminoethylmethacrylate known with its trade name Amphomer, copolymer of methacryloylethylbetaine and alkyl methacrylate known as Yukaformer, terpolymer of metahcrylic or acrylic acid and itaconoic acid and a basic monomer of mono or dialkylaminoalkyl acrylate or methacrylate or acrylate of methacrylamide known with the trade name Aquaflex SF 40. 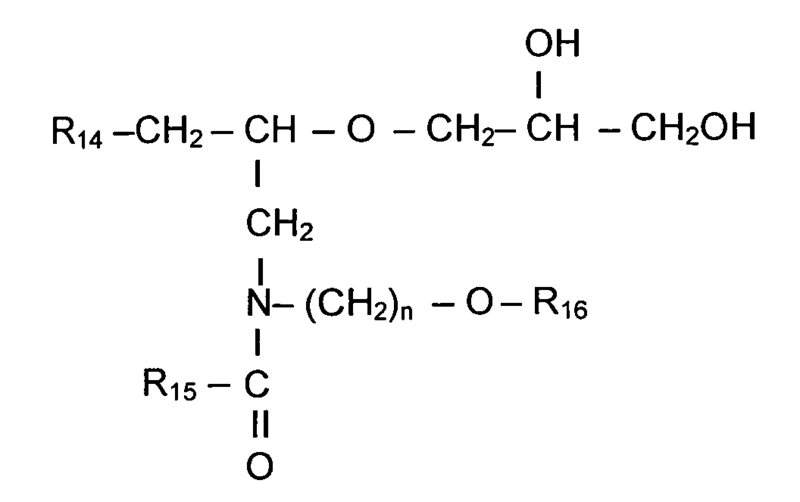 As amphoteric polymers which can be used alone or in mixture with at least one additional cationic and/or nonionic polymer, reference is here made in particular to copolymers of N-octyl acrylamide, (meth)acrylic acid and tert.-butyl aminoethyl methacrylate of the type "Amphomer®"; copolymers from methacryloyl ethyl betaine and alkyl methacrylates of the type "Yukaformer®", e.g.. the butyl methacrylate copolymer "Yukaformer® Am75"; copolymers from monomers containing carboxyl groups and sulfonic groups, e.g.. (meth)acrylic acid and itaconic acid, with monomers such as mono- or dialkyl aminoalkyl (meth)acrylates or mono- or dialkyl aminoalkyl - (meth)acrylamides containing basic groups, in particular amino groups; copolymers from N-octyl acrylamide, methyl methacrylate, hydroxypropyl methacrylate, N-tert.-butyl aminoethyl methacrylate and acrylic acid, as well as the copolymers known from US-A 3.927.199. Anionic polymers may as well be contained in compositions of the present invention. Suitable ones are vinyl alkyl ether, in particular methyl vinyl ether/maleic acid copolymers, obtained by hydrolysis of vinyl ether/maleic anhydride copolymers, distributed under the trade name "Gantrez® AN or ES". 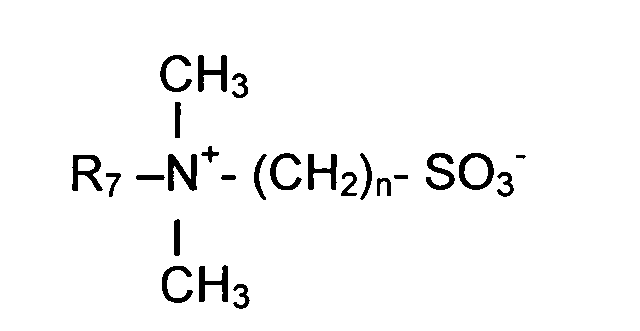 These polymers may also be partly esterified, as for example, "Gantrez® ES 225" or "ES 435", the ethyl ester of an ethyl vinyl ether/maleic acid copolymer, or the butyl or isobutyl ester thereof. Further useful anionic polymers are in particular vinyl acetate/crotonic acid or vinyl acetate/vinyl neodecanoate/crotonic acid copolymers of the type "Resyn®"; sodium acrylate/vinyl alcohol copolymers of the type "Hydagen® F", sodium polystyrene sulfonate, e.g.. "Flexan® 130"; ethyl acrylate/acrylic acid/N-tert.-butyl acrylamide copolymers of the type "Ultrahold®"; vinyl pyrrolidone/vinyl acetate/itaconic acid copolymers, acrylic acid/acrylamide copolymers or the sodium salts thereof of the type "Reten®"; etc. Concentration of polymers of anionic, cationic, non-ionic and/or amphoteric or zwitterionic character is in the range of 0.05 - 10%, preferably 0.05 - 7.5% and most preferably 0.05 - 5% by weight, calculated to the total composition. The following examples are nonlimiting and to illustrate the invention. Phase A and Phase B are heated up to 80 °C and subsequently Phase B is mixed into Phase A under continuous agitation. After cooling down to 60°c Phase C is added and the mixture is cooled down to room temperature. The preparation so obtained has a viscosity of 1,200,000 mPa.s measured as given in the description. pH of the composition measured at ambient temperature is around 6.0. The composition is prepared in the same way as in the example 1. The preparation so obtained has a viscosity of 1,400,000 mPa.s measured as given in the description. pH of the composition measured at ambient temperature is around 6.0. The examples 1 and 2 are compared in a half side comparison test. For this purpose 10 volunteers with shoulder length hair are selected. After washing hair of the volunteers with a commercially available shampoo under the brand name Goldwell Definition and drying with a hair dryer, equal amounts (approximately 0.75 g per half side) of the examples 1 and 2 are applied each half side. Hair properties are evaluated by at least 3 expert hairdressers. From the evaluation results it is obvious that the side treated with the example 1 showed always significantly better shine and softness. The other side is evaluated to have significantly less shine than the side treated with example 1. In addition the stylability and volume of the hair is judged to be better in 60% of the case for inventive preparation and in the remaining cases no difference is found. The composition is prepared in the same way as in the example 1. The preparation so obtained has a viscosity of 1,100,000 mPa.s measured as given in the description. The composition of example 3 is compared to a composition not containing any PEG 45M and dimethicone otherwise quantitatively same as the composition 3 in a half side comparison test. For this purpose 10 volunteers with shoulder length hair are selected. After washing hair of the volunteers with a commercially available shampoo under the brand name Goldwell Definition and drying with a hair dryer. Equal amounts of preparations (0.75 g per half side of inventive and non inventive compositions) are applied each half side. Hair properties are evaluated by at least 3 expert hairdressers. From the evaluation results, it is obvious that the side treated with the example 3 (inventive composition) showed always significantly better softness and better feeling when touching hair and especially high brilliance (shine). The other side treated with composition not comprising any PEG 45M and dimethicone (non-inventive composition) is evaluated to have significantly less softness than the side treated with inventive composition. In addition, the stylability and volume of the hair is judged to be better in 60% of the case for inventive composition and in the remaining cases no difference is found. The composition is prepared in the same way as in the example 1. The preparation so obtained has a viscosity of 610.000 mPa.s measured as given in the description. Similar results are obtained as in examples 1 and 2 (non inventive), and 3, when composition according to Example 4 is compared to a non inventive composition produced either by exclusion of silicone component or by exclusion of high molecolare weight polyethylenegylcole. Hair treatment composition according to claim 1 characterized in that it is a micro emulsion. Hair treatment composition according to claims 1 and 2 characterized in that it is free of fatty alcohol and waxes. Hair treatment composition according to claims 1, 2 and 3 characterized in that it comprises one or more nonionic surfactants as emulsifier. Hair treatment composition according claims 1, 2 and 3 characterized in that it comprises one or more anionic surfactants as emulsifier. Hair treatment composition according to claim 5 characterized in that it comprises as anionic emulsifier surfactant trilaureth-4-phosphate. Hair treatment composition according to any of the preceding claims characterized in that it comprises mixture of anionic and nonionic surfactants as emulsifiers. Hair treatment composition according to any of the preceding claims characterized in that it comprises emulsifiers at concentration of 0.5 to 35% by weight calculated to total composition. Hair treatment composition according to any of the preceding claims characterized in that it comprises mixture of emulsifiers of nonionic and anionic types at a ratio of 10:1 to 1:3, preferably 5:1 to 1:2, most preferably 2:1 to 1:1.
claim 1) at a concentration of 1% to 35% by weight, calculated to total composition. Hair treatment composition according to any of the preceding claims characterized in that it comprises silicone oil (component c of claim 1) at a concentration of 1% to 35% by weight, calculated to total composition. Hair treatment composition according to any of the preceding claims characterized in that it comprises oil components (sum of the components b and c of claim 1) at a concentration of 1 to 35% by weight, calculated to total composition. Hair treatment composition according to any of the preceding claims characterized in that it comprises natural and/or mineral oil and silicone oil at a weight ratio of 20:1 to 1:1. Hair treatment composition according to any of the preceding claims characterized in that it comprises polyethyleneglycol with a molecular weight of more than 10,000 at a concentration of 0.05% to 2.5% by weight calculated to total composition. Hair treatment composition according to any of the preceding claims characterized in that it comprises one or more polymers selected from anionic, cationic, nonionic and/or amphoteric ones. Hair treatment composition according to any of the preceding claims characterized in that it comprises additionally UV filters. where R14 and R15 are independent from each other alkyl- or, alkenyl group with 10 to 22 carbon atoms, R16 is methyl, ethyl, n-propyl or isopropyl group and n is a number between 1 to 6, preferably 2 or 3. Hair treatment composition according to any of the preceding claims characterized in that it comprises fatty acids with 10 to 24 C atoms. Hair treatment composition according to any of the preceding claims characterized in that it comprises phytosterol. Hair treatment composition according to any of the preceding claims characterized in that it has a pH value between 5 and 8. Hair treatment composition according to any of the preceding claims characterized in that it has a viscosity of at least 100,000 mPa.s measured at 20°C with a Brookfield viscosimeter with Spindle F from Helipath Spindle Set at 10 rpm. Use of hair treatment composition according to any of the preceding claims for improving hair shine and softness. ES2102822T3 (en) 1993-01-23 1997-08-01 Henkel Kgaa detergent mixtures with improved properties amidated.